After leaving Marquesas, our original plan was to head to Raroia, in the central Tuamotos, where Thor Heyerdalh’s famous Kon Tiki raft ended up. Then we met a friendly mechanic teacher named Leon in the boatyard, who invited us to his atoll. Upon hearing we were aiming to arrive by Sabrina’s 33rd birthday, Leon announced, “It will be my pleasure to make you a dinner party!” So Makemo became our goal. – In the southern summer (Dec-March), the trade winds blow from the ENE. – In the southern winter, the typical cruising season, trades are typically ESE (ie. 100-120 degrees) with 9-18kts. – Every few weeks, a “maa’ramu” wind event occurs, which is a strong SE (ie. 125-140 degrees) with 18-28kts lasting several days with squally rain. In navigation planning, we must look at the predicted wind and our bearing. From Marquesas (Ua Pou island) to Tuamotos (Makemo atoll) the bearing or angle is 205 degrees (SSW). We needed to wait a few days for the maa’ramu wind to weaken from 25kts to 18kts (ie. the trades to normalize), and the wind to shift from 140 to 125 degrees. The difference between 205 (our bearing) and 125 (the estimated wind angle) is 80 degrees. This is our theoretical “point of sail” to the wind. In actual practice we lose up to 10 degrees to slippage in rough-ish seas, expected as leftover from the nasty maa’ramu windchop. Furthermore, the “apparent wind” of the sailboat is another 10 degrees forward since we are moving with speed into the wind (think about the difference between bike riding upwind and downwind; this is apparent wind). What does this mean? Despite the “point of sail” being 80 degrees, our actual course needs to be about 60 degrees to the wind, and occasionally 50 degrees to the wind, to account for variability (and steering ability!) This is about as tight an angle as our trimaran is able to go in open seas (sailing in a smooth bay we can go an additional 10 degrees upwind). Therefore sailing to Makemo is about as “upwind” as we can confidently go with current conditions. We also hope the trades will normalize and give us additional comfort. How long will the passage take? The distance to Makemo is 470nm (nautical miles). We tend to average 5-6 knots (nautical miles per hour) on Aldebaran if the wind is over 10 knots. This means we sail about 120-140 nm every full day. (Under motor power in smooth seas we cruise at 6 knots). To undershoot it, we usually use 120nm as our average, so we expect 4 days and nights for the transit, as the wind is expected to hold in the 12-18 knot range. Many round-the-world cruisers take the fastest route across the Tuamotos. 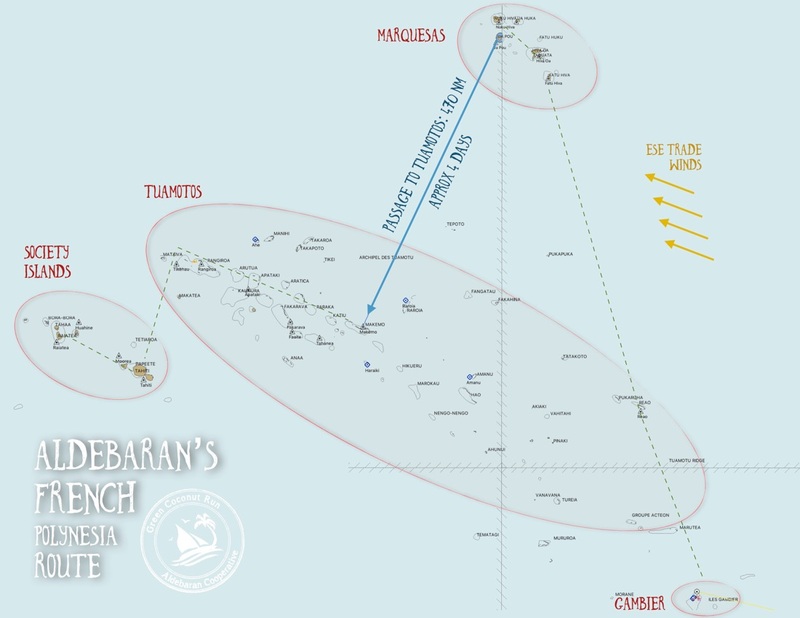 From Marquesas to Rangiroa atoll, en route to Tahiti, the bearing is 230 degrees. This equates to a delightful 110 degree (theoretical) point of sail. However this means they can only visit the northern atolls. Our route takes us into the heart of the Tuamotos archipelago and allows us to visit famous atolls like Fakarava. – Pitcairn to Gambier, 3 nights. 320 nm via Oeno atoll, 280 degree bearing. We took this route to see Oeno; plus, a north wind was blowing. ← Marquesan school kids go to Chile conference! Happy Birthday Sabrina. So glad you were celebrated in style. Nice explanation Kristian of the technicalities of sailing in the South Pacific. Happy birthday Sabrina from sv Ballena! Really enjoy reading your blog, great writing. .
Have you guys heard about deepsea cobalt mining in FP? Major deposit found in volcanic vents by Tuomotus & Australs. Recently read Canadian & NZ mining operations are positioning to extract it off ocean floor, kicking up clouds of heavy metals..sounds grim.. i wish the people there knew what’s being planned. .Cobalt is used in batteries of almost all electronic devices.. I know you guys are active in environmental awareness. Two thumbs up! Enjoyed reading it all! Hope you are having a great birthday celebration. Cheers from the Booby Trap!